Going to combine several trips into one report. Had some computer problems and a lot of traveling so these are a little delayed. 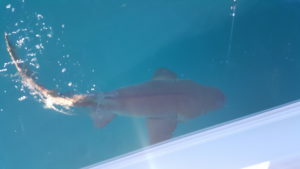 First pic is from December 23rd , seas were rough so we took some live bait and chum to the reef. Water was dirty and the bite was slow. 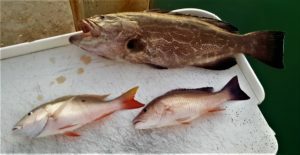 Caught a few reef fish; yellowtail, small groupers and grunts. Put out a live bait on the freeline. Action was slow but steady on the smaller stuff. Finally got the line screaming of the live bait. After a nice battle we bring a good size Cero to the boat. 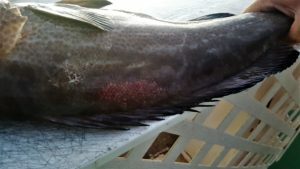 Circle hook did its job in the corner of it’s mouth and we have a tasty cero for dinner. Next pic is from December 24th tip to the Marathon Hump. Got a nice forecast for Christmas Eve, so took wife and son to the humps. 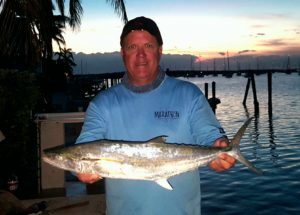 Casey loves tuna and it makes it even better when he catches his own dinner. Loaded up the World Cat and made our way out the creek. Seas were calm and we made the 27 mile trip in no time. We got our usual baits out and it did not take long before we had the first one on. We started out with a 6500 spinning and a small penn conventional. We put a few footballs in the box but were losing the bigger ones. Put the spinner up and troll with a 16 and 30 penn. We put a few more in the box but still losing the bigger ones to sharks. Next set up is with a 50 wide to try and wench the fish in before the sharks get them. Made several more passes and never got the real big ones. In two hours had plenty for the entire crew and neighbors. 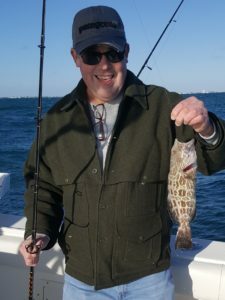 Next 4 pics are from Christmas Day fishing in 90’ on reef edge. Family time in the morning then a beautiful Christmas afternoon on the water. Picked up some pilchards on the way out to set up for grouper and others. 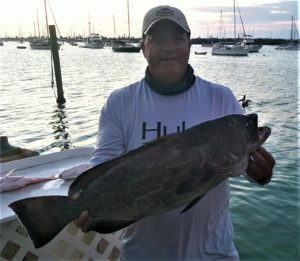 Went to one of my spots for grouper in about 85-95’ and dropped the anchor. 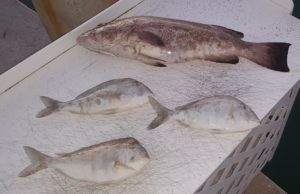 The sounder looked good so we drop baits to the bottom and I send a live bait out on the freeline.­­­ Wife brings up some porgies on the chicken rig. I get hit hard on bottom rod and it felt like a good one. I keep the pressure on and finally got his head turned and coming to the surface. 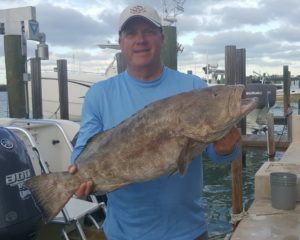 Up pops a nice grouper and now we got some great eats in the box. I set up another live one to send to the bottom. Just as I get the bait down my wife notices a fish jumping behind the boat. I catch it out of the corner of my eye and grab the 6500 spinner with the freelined bait on it. Line is still slack but the fish rolls off to the right. I start winding in the slack and at the same time the line goes tight – fish on. Still not sure what it was but I thought maybe a kingfish as the drag is screaming and line is leaving the spool. I tighten up the drag as I try to slow the fish down and start to gain some line back after the first run. Fish never jumps but keeps pulling drag and works me around the boat. 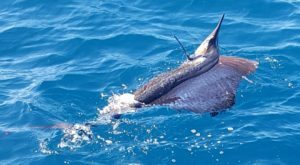 Finally identify it as a sailfish as it goes around the bow and near the anchor line. Never got any tailwalking but some bill slashing as it got closer to the boat. This was a good size sail and as I got it next to boat while trying to decide what type of picture to take it pulled the hook. Well that was a lot more fun that a cero or king. With a grouper and porgies in the box and a sailfish release I get out the slow pitch rod to try something different. I work it a few times and catch a 15” mutton that is sent free. Some great weather and a fun day on the reef. Next couple of pics are from December 26 on the reef. Got out on the reef about 3pm with no live bait and little dead bait. Got anchored and set the chicken rig down to get some live bait. Crafty bait stealers at this spot made it difficult so I put a dead horse hoo on the bottom rod. My chicken rig has something big on and I am thinking a shark came and ate a grunt I hooked. 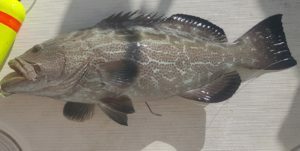 I battle it to the surface and it turns out to be a 20” black grouper that I release back to the bottom. Continue to work at the live bait and finally pull up a couple grunts. Replace dead bait with a grunt and send it to the bottom. Next drop on the chicken rig I get another hard fighting fish and put a nice mango in the box. Just as I set up for another drop the bottom rod looks like it has a nervous fish so I grab the handle and get ready. As I give it a couple cranks to get it off the bottom at the same time it gets slammed. I reel fast and think that I got this one beat when all the sudden it is pulling drag. Up to max drag and cranking hard I get it turned and into the box goes a nice 29” grouper. When at the cleaning table I notice some naw-bite marks, I think a goliath tried to eat it. Next drop is with a new slow pitch rig to try out. 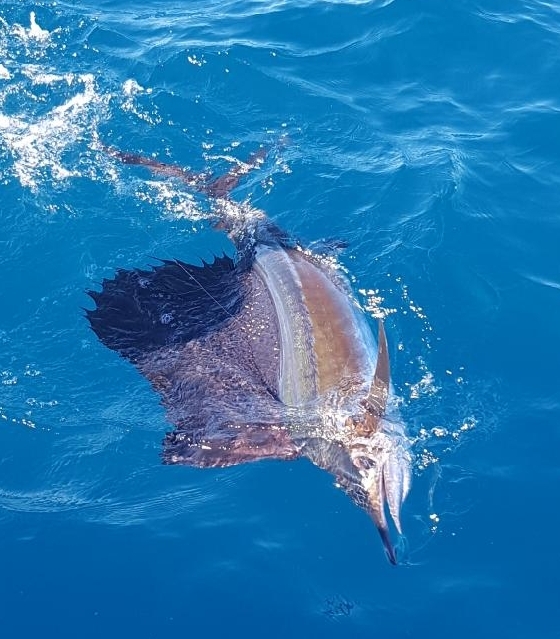 Second drop – fish on and I get a mutton to add to the box. Not big but 17” is legal and good eating. With still some work to finish I head back in. 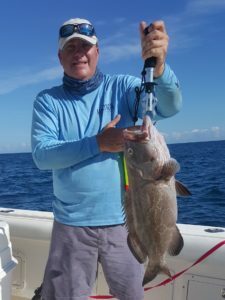 It has been a great few days and the grouper bite is hot. Next pic is of a big mangrove snapper on the reef December 29th. Next 2 pics from December 30th on the reef. 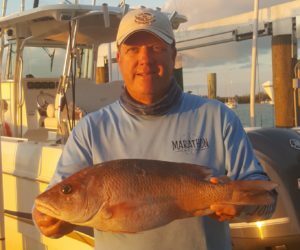 Two days left before grouper closure and I got another late start. Headed out around 11 am to catch the rising tide in the afternoon. Anchored on the same general area just a little deeper. Only had to re-anchor twice to get on the right spot today. There was a hard-north wind blowing and current running east. Sounder was lit up but the catchin was slow. I worked thru a lot of small YTs and got a couple of porgies on the chicken rig bait rod. Dropped two bottom rods with live bait on. Both set ups were slow and got rocked up a couple times. Live bait produced another nice size mangrove 18’. With the wind howling, cloudy skies and a slow catch I was thinking about packing it in. I had just caught another good-sized grunt so down he went. This time after reaching the bottom the bait got nervous right away. I am at the reel when the rod doubles over and I crack as hard as I can and turn his head up. As slow as it has been I thought this might be a shark and half way up it kinda made a circle. I keep cranking and up pops a nice black. This one is 32” and it gets an ice bath. I work a couple of dead baits trying for a mutton but no luck. It is windy and cold so I fire up the cat and head north right into the breeze. A 36’ See Vee with trips wanted to race me back in but after about 1 mile he backed down. I think his passengers were crying uncle and I was drinking a soda and not spilling a drop. Next few days were very windy with rough seas. Made a couple short trips Dec 31 – Jan4th. 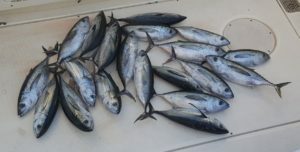 Fishing was slow and we caught the usual small reef fishes plus a couple sharks. The weather was very windy and cold which made for some uncomfortable conditions. Not much picture worthy so until later this month here are a couple.